If you're not planning on grilling this Independence Day, you should be! 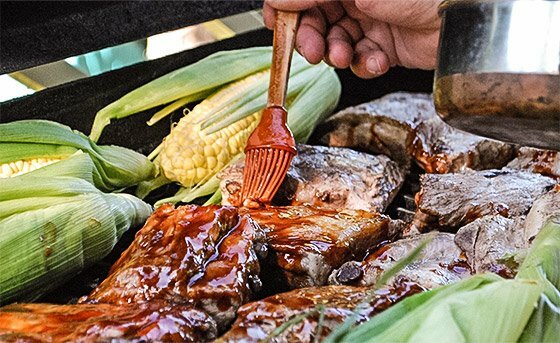 Find out why grilling is a superior way to cook, and try new recipes that will wow your fellow partiers. Independence Day cookouts and fireworks bring friends, families, neighbors and co-workers together. Although some of our picnic table food choices may not be smart - cupcakes and pies always seem to find their way - fire-working your food is a healthy choice you can feel good about. Grilling adds flavor combinations to meat, fish, vegetables, potatoes and fruit. The possibilities are protein-packed, virtually endless, and great for anyone&apos;s fitness goals. Ditch the sugar-laden BBQ sauce in favor of flavorful rubs, fresh ingredients, and antioxidant-packed produce. Grilling is one of the leanest ways to cook. You can actually watch the fat drip off! 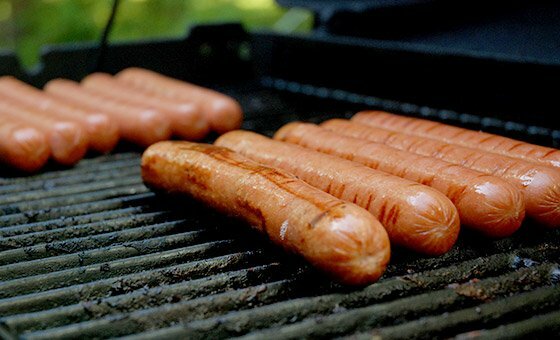 Grilling reduces both the calorie and saturated fat content of your food; what else needs to be said? Grilling adds unique flavor to your food. You don&apos;t need to douse your steak in high-calorie, high-sugar sauce. If you use sauce, remember a little goes a long way. "Grilling reduces both the calorie and saturated fat content of your food." Grills heat up and cook food quickly. There&apos;s no need to preheat or prep the grill (besides brushing off the remnants from your last grilling session). If you&apos;re time-pressed, grilling is a solid option. Grilling is a great way to get off the couch and enjoy Mother Nature. Don&apos;t stand over a stove; go outside and enjoy the sights, smells and sounds of the great outdoors! Keep fresh rosemary and lemon pepper next to the barbeque at all times. This adds extra flavor to your food without increasing the calorie or fat content. Don&apos;t hesitate to experiment with your seasoning mixtures! Try different flavors and amounts until you find the perfect combo! Marinating is one of the top ways to boost flavor and moisture in your meat. Throw steaks, chicken or salmon into a large Ziploc bag and pour in marinade sauce. Allow the meat to marinate for at least two hours to let the juices soak in. Watch out though, some marinades can be pretty high in sugar and calorie content. A nice set of grilling utensils adds pizzazz to your grill and builds cooking confidence. Use a metal spatula (plastic melts!). Use sturdy tongs; nothing is worse than grilling, and then dropping, Americanized meat. You look like a veteran grillmaster with the right tools! If you&apos;re in a time crunch but still want a grilled dinner, partially cook your food in the microwave first. It won&apos;t alter the taste too much and it definitely speeds up the cooking process. Don&apos;t kill the grill flavor by drowning your meat in sauces! Sauces should add to the unique flavor of the grill, not overpower it! Grilling it up for the Fourth? Try some of these recipes! Combine garlic, olive oil, lemon juice, salt, and Italian salad dressing in a bowl. Add shrimp into the bowl and toss until well coated. After marinating, shove shrimp on the skewers. Put tinfoil on the grill and set at medium heat. Put kabobs on grill for 10-to-15 minutes; make sure shrimp is fully-cooked, and enjoy! Spray a baking dish safe for the grill with non-stick spray. Cut pears in half, removing the cores and place the cored side down in the dish. In another bowl, mix together white wine and Splenda and pour over the pears. Place the cinnamon stick somewhere around pears and place on the grill for about 15 minutes. 6. When pears are soft and can be easily pricked with a fork, remove and serve immediately with a tablespoon of whipped topping. In a small bowl, combine Dijon mustard, honey, Splenda, mayonnaise and garlic. Dip chicken into mixture and let sit for 5-to-10 minutes coated. Place chicken onto grill and cook for 18-to-20 minutes per side, turning occasionally. Cut peppers into large pieces. Slice onion into relatively large circular pieces about half an inch thick. Place a skewer through peppers and onions to keep them in place before placing on grill. In a small bowl, combine olive oil, balsamic vinegar, oregano, garlic powder, and salt and pepper. Coat vegetables with mixture and place on the grill. Grill for 10-to-15 minutes, continually brushing with dressing and flipping at halftime. Stop blindly following someone else&apos;s nutrition protocol with middling results. Start making a nutrition strategy that works specifically for you! Here&apos;s some conversation fodder to make you seem smart the next time you&apos;re by the office&apos;s communal coffee pot.